Demographic changes project an ageing European population, coupled with increasing life expectancy and a reduction in birth rate, it is estimated that the ratio of people in the EU aged 65+ compared to the people aged 15-64 is to increase from 28% in 2015 to 50% in 2060. 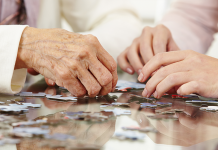 Solutions are needed to counteract the associated costs of an older population – longer life expectancy is often connected to increased frailty, illness or disability amongst those living longer and as such higher costs for health and social care. 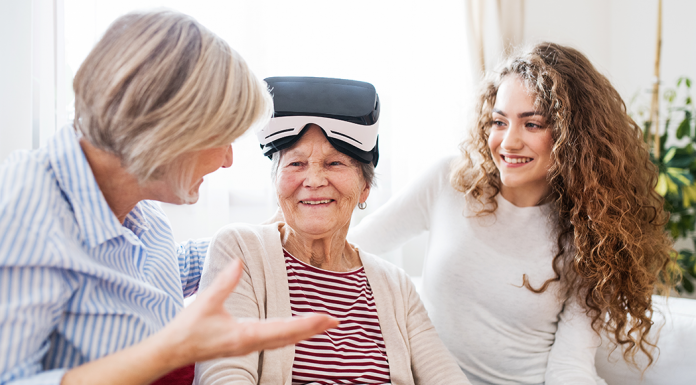 Ambient Assisted Living (AAL) technologies offer an untapped solution to counteract some of these potential costs. 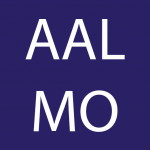 The AAL Association has recently launched the AAL Market and Investment Report. The report aims to serve as an information source and guide to investors, start-ups and small and medium enterprises (SMEs), mature companies, and policymakers interested in technology solutions to support older adults live independent, healthy and happy lives. The report provides an overview of the existing AAL market and recent AAL-related investments. The report summarises that the European AAL market is a very diverse and rapidly growing market. 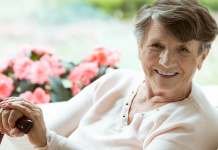 Simple AAL solutions include products such as pressure mats or emergency buttons – underlying services for the monitoring of older people and on-demand contacts. 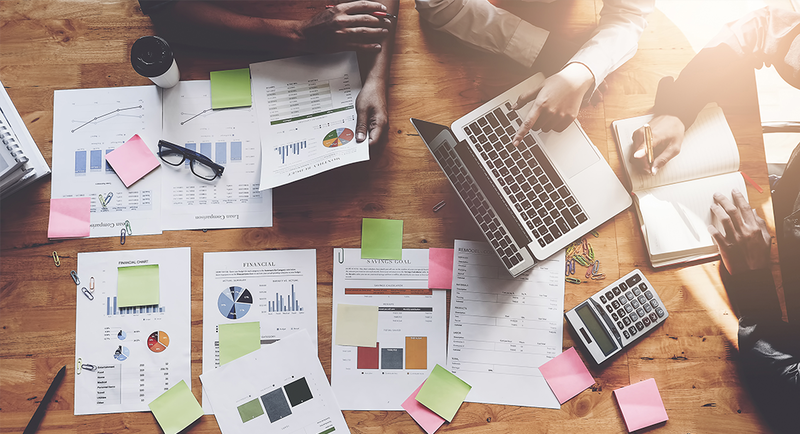 Increased consumer awareness and technological solutions coupled with inclusive services are offering new opportunities to better cater to the a growing consumer segment. 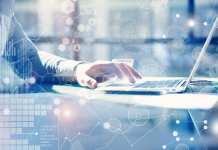 Areas of opportunity identified include AAL solutions that improve the efficiency and productivity of health care systems, solutions that offer integrated care solutions, and solutions that integrate data processing technologies and artificial intelligence. The figure below (Figure 15 in the report) provides a visual illustration of the potential of the AAL market. 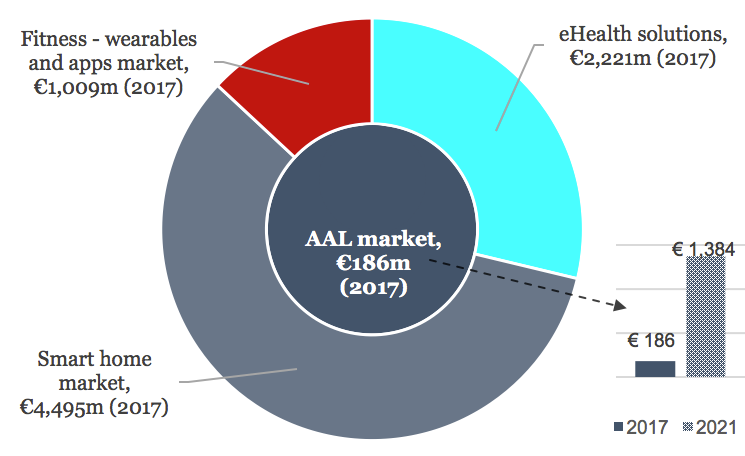 It highlights the current AAL and related markets in the EU (2017) while demonstrating the expected growth of the AAL market by 2021. The EU AAL market is estimated increase sevenfold in just four years, showing a huge potential for investment and activity. 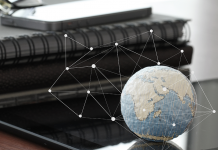 Currently the EU market represents 21% of the global AAL market, however by 2021 the EU market size is expected to account for 26% of the global market, a 5% increase. 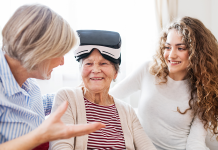 The rapid market penetration of AAL technology is expected to increase even more beyond 2021, when a ‘new’ generation of older people, who are more tech-savvy than the previous generation, will grow older and be more inclined to invest in solutions. There are other sectors closely related to the AAL market that have already shown rapid growth in recent years and are larger markets today with the prospect of increasing further. These include fitness trackers, wearables, eHealth and smart home solutions. Fitness trackers and wearables focuses on devices that are explicitly intended for fitness. In particular, fitness wrist wear which is equipped with sensors and activity trackers that measure and analyse the physical activity and body functions of the wearer. Smart Clothes and Eyewear are included. Smart home technology – the smart home market encompasses: home automation, security, home entertainment, energy management, and the AAL market. The market covers the sale of networked devices and related services that enable home automation for private end users (B2C). Despite the clear avenues of expansion it is paramount to note that the market has some barriers. As discussed in the report, the AAL market is not seen as an easy market for start-ups looking to get investors on-board. When appealing to investors, start-ups are challenged to identify the ‘right’ consumer segment for the proposed AAL solution. 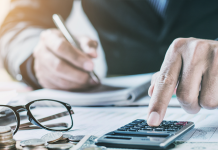 For example, some investors prefer investing in solutions that target a consumer segment that is visibly large enough to easily allow scaling-up and thereby produce immediate income and return on investment. Some have a preference for solutions that integrate universal design and appeal to both the young and older customer. 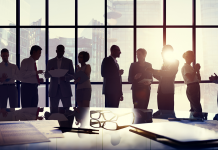 This is not always the immediate preference of companies, including those that focus on providing a personalised offer to a diverse and heterogeneous age group (e.g. including the active and healthy and the more frail). Moreover, the investors consulted as part of the report find that, before investing in a potential solution, they would like to see (1.) at least a few months of real world data demonstrating potential for profitability and (2.) engagement of end-users in the development of solutions. Previous articleGet your sociAAL life on!